As we offer a trade in service for pre owned Orange Bikes we will from time to time have some excellent second hand Orange Bikes for sale. All checked and serviced by us and in full working order. If you have an Orange Bike or frame and you want to trade it in for a new one get in contact. 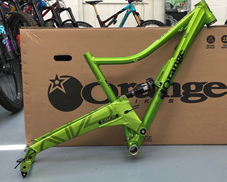 We have taken this large 2015 Segment frame in as part ex for another Orange. The Apple Green colour is no longer made by orange but it was very popular. The paint has stood up very well. There are a few marks here and there but nothing more than you wold expect. We have given the frame a once over and it is very good condition and the bearings will receive an overhaul.